A big thank you to iWindsurf/Weatherflow for the new Viento wind sensor. West wind building/dying in the corridor? Now you can check. This will be awesome for east wind foil sessions too. We all have to thank Stuart of the Sensor Install crew for installing this new sensor on the Coast Guard Nav. Aid as well as Matt and Ben who did the endless paper work with the Dept. of Defense to get permission for this installation. And thanks for Guy who has camped at Viento for years and often sails there in the morning before heading to the Hatch. He was the one who met with us at Viento and confirmed that the sensor Nav. Aid location would be useful. Basically the sensor will read low compared to the wind mid river but once you figure out the correction factors it should be useful. Below are images of the sensor and its location. 3. Often on light wind 4.7 - 5.2 days there is not much swell and people do not make the drive to Hatch and Swell. On these small swell days the wind is concentrated just in the Hatch and Swell zone. But other times on light wind days there is great swell at Hatch and Swell IF Viento is also blowing. Even mild wind can make good swell if the entire corridor is blowing making for a long fetch. 4. And for those who are here only for a short time... they can now catch the early morning winds at Viento before the Hatch and Swell zone becomes reliable. 5. Lastly this sensor will help forecasting since it is an additional pressure reading in the corridor. We will soon have this sensor on the Classic IW map. The Roosevelt sensor did not belong to us. We put it on our sites as a Public Domain sensor as a service to our customers. Unfortunately the owners of the sensor did not repair it when it failed. So far we have not found a property owner next to the river at Roos who will host one of our sensors. So we moved the Arlington sensor to a new location right next to the water and closer to the water surface. That it is a bit more useful for the Roos launch. I also miss the Roos sensor but frankly there are very few sites where we have 2 sensors just across the river from each other. 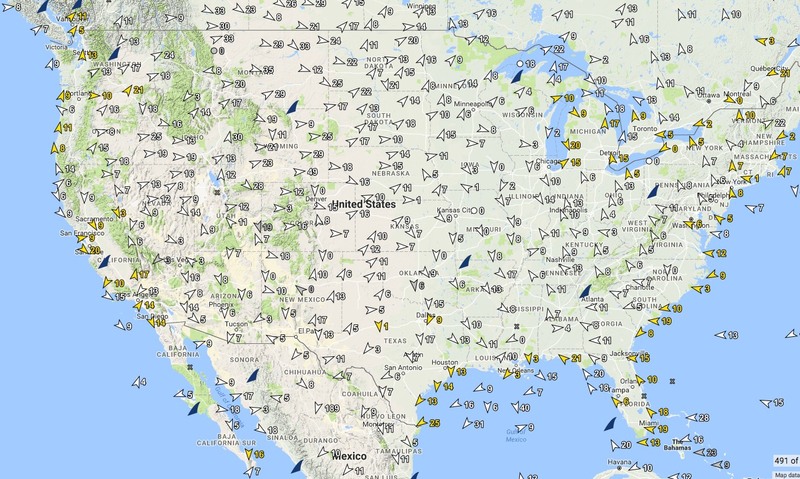 Incidentally we have over 700 of our own weather stations just in the USA. At any given time about 99% of them are operational. That still means that at any given time about 5-10 of then are down somewhere in the USA due to lightning, corrosion, boat collisions with Nav. Aids, fallen trees, fishing or kite line etc. So we have East coast and West coast repair crews flying around the USA repairing sensors or installing new sensors like the Viento. Unless there is an unusual circumstance like our needing to charter a boat or gaining access to a site we usually have sensors back in operation in a couple weeks or sooner. Here is a video I shot over one especially busy weekend to give customers an idea of what sensor installation and repair entails. Thanks to you and your team for all the great work and effort! The new sensor shows Viento cranking in the upper 20's today, so I showed up, only to discover that the park is closed. How the heck was the sensor installed given that there's no open access road? Road access would not help since the Coast Guard Nav. Aid. where the Viento sensor is located is out in the river. The sensor crew uses boats to access the Rooster Rock, Dougs, The Wall and 3 Mile Canyon sensors since they are all out in the river. That is why those sensors sometimes take longer to repair when they are down. We have to obtain a boat and wait for a day with no wind or swell. Plus it takes a larger repair crew.